Today, scientific collaboration is no longer a special consideration and has instead turned into a necessary part of scientific research. Scientific collaboration means cooperation between different researchers and research centers to achieve common aims and improve scientific production. In general, these collaborations can be categorized into between or within forms and also based on their spatial scale. These two types of collaboration are shown with intra- and inter-prefix, respectively. For example, collaboration between different departments is called intradepartment collaboration while collaboration in a certain department is called interdepartment collaboration. The changes of scientific production behavior worldwide and exponential increase in the number of multiauthor papers in the last decades are obviously apparent. Currently, there is a consensus in the scientific community, stating that this increase in multiauthored articles is the sign of increased scientific collaboration,, and scientific sociology is currently paying increased attention to the study of scientific networks, especially co-authorship networks, as the most common forms of scientific collaboration. Social network analysis (SNA) is a method for analyzing the interactions between groups or actors present in these networks. Therefore, the current study aimed to use SNA indicators to provide a complete picture of intradepartment collaborations in different fields in Journal of Research in Medical Sciences (JRMS) during 2012–2016. It is also possible to use clique analysis to identify similar behavioral patterns and similarities between departments and research centers as well as departments and research centers with strong connections to each other. Since medical experts deal with complex and multidimensional problems such as health and diseases in society, cooperation among departments and research centers offers advantages such as reduced financial costs and using the knowledge of different experts and leading to improved productivity. Publication of the studies carried out through intradepartment collaborations in JRMS can expand the audience and provide more visibility by the experts in different areas that both influence its effectiveness on the scientific society. The study was a scientometric study using micro- and macro-indicators of SNA. The population consisted of 1073 articles published in JRMS in 2012–2016. To create the collaboration network of departments, each article was separately loaded in a computer and affiliation of its authors was extracted. Then, the organizational title of departments and research centers was normalized. Co-authorship matrix of these institutes was created using Ravar Matrix software (version 2, Ravar Matrix, Yazd, Iran). To create and analyze the co-authorship between authors, UCINET (version 6.463, UCINET, Harvard, MA) and VOSviewer software (version 1.5.4, VOSviewer, Leiden University, Leiden, Netherland) was employed. In this study, collaboration network of departments and research centers in JRMS between 2012 and 2016 was investigated using macro- and micro-level metrics. Macro-level metrics such as density, clustering coefficient, mean distance, network diameter, network components, and network clustering were evaluated. The study also investigated the performance of each department and research center using centrality and collaboration indicators. Productivity indicator shows the number of articles published by authors with certain affiliations in JRMS between 2012 and 2016 while degree centrality shows the number of co-authorships of authors affiliated with a certain department or research center with researchers from other centers or departments. Betweenness centrality of a department shows the number of times that the department is connected to other department using the shortest possible link in the network. Closeness centrality of a node is the shortest possible link between that node and other nodes in the network. Density metric is the ratio of the connections present in the network to the total possible connections and has a value between 0 and 1. Clustering coefficient is another metric which shows the trend of departments and research centers present in the network for forming different clusters through co-authorship; it is also between 0 and 1. The network diameter metric shows the largest distance between nodes in the network. A component is a set of nodes (departments and research centers), in which every node is connected through a direct connection (co-authorship) or a chain of connections (co-authorship network) to other nodes. In other words, each node of a component is connected through a direct connection or through several connections to other nodes in the same components. The details of the indicators have been described in Zare-Farashbandi et al. Assessments showed that co-authorship network of JRMS derived from the activities of 337 departments for a total of 1950 collaborations. Network analysis based on macro-level metrics showed that the density metric for co-authorship network of departments and research centers in JRMS is equal to 0.012. In other words, only 1.2% of potential relations between departments and research centers were actualized which show open social relations and low network coherence. The clustering coefficient for this network was equal to 0.37 which means that if two departments or research centers, A and B, have separate co-authorships with node C, there is a 37% probability that A and B departments will have co-authorship relations in the future. The results also showed that the average distance between nodes in co-authorship network is 2.836. Based on these results, each two departments or research centers in this network are connected to each other with an average of 2.8 intermediaries. The network diameter metric shows the largest distance between nodes in the network. This metric is equal to 6, showing that departments and research centers with the largest distance from each other have a distance of 6 nodes. This study also investigated the components of co-authorship network of departments and research centers. This co-authorship network consists of a total of 44 components. The main and largest component includes 277 nodes which is a total of 82.2% of all the nodes in the network. There are also 29 isolated components with only one node each without any co-authorship with other departments or research centers [Figure 1]. The cluster analysis of co-authorship network of departments and research centers in JRMS showed that this network consists of 77 separate clusters. Cluster 26 containing the Department of Epidemiology and Biostatistics and cluster 21 containing the Department of Pathology are the most important clusters in this network. Investigating the collaboration between departments and research centers in JRMS using productivity and centrality indicators showed in [Table 1]. In studies which analyze scientific collaboration networks, usually, subgroups of the network are also analyzed along with the network itself. One of the methods for identifying and analysis of dense and continuous subgroups in social networks is clique analysis method. A clique is a subgroup of the network with density of 1 in which each node is connected to all other nodes in the group. For example, in a social network of friends, a clique is a subgroup of people in which each member knows all other members. Clique is usually considered to be the most important indicator of societies in social networks where nodes have a large number of interactions with each other along with common characteristics, therefore increasing the speed of information flow between these nodes. In this study, the minimum size of 7 was used for clique analysis, and therefore, a total of 19 cliques were identified in the network [Table 2]. The results showed that only 30 nodes (8.90% of total nodes present in the network) belonged to cliques with at least 7 members and other nodes were members of smaller cliques [Table 2]. On the other hand, investigating clique-by-clique actor co-membership matrix of cliques in co-authorship network of JRMS showed that cliques 1&2, 1&8 2&3, 2&9, 3&6, 3&10, 3&16, 4&5, 5&6, 5&12, 6&17, 9&10, 11&12, 16&17, 16&19, 17&18, and 18&19 with a total of 6 overlapping members had the highest amount of similarity, while in 18 cases, there are no common nodes between cliques which means that nodes of these cliques had no scientific collaborations with each other. The current study evaluated the collaborations between departments and research centers in JRMS between the years 2012 and 2016 based on SNA indicators and clique analysis. The situation of co-authorship network in JRMS based on macro-network metrics is as follows: the network with low coherence with small number of potential collaborative connections being actualized. On the other hand, the desire of departments and research centers for co-authorship is low. Low centralization of departments and research centers around certain powerful departments has led to disconnection and lowered centralization metric. One of the reasons for this low centralization is the naming method of departments and research centers so that departments and research centers with similar specializations use different names. This leads to creation of small co-authorship groups around various names instead of formation of large groups around a central node. 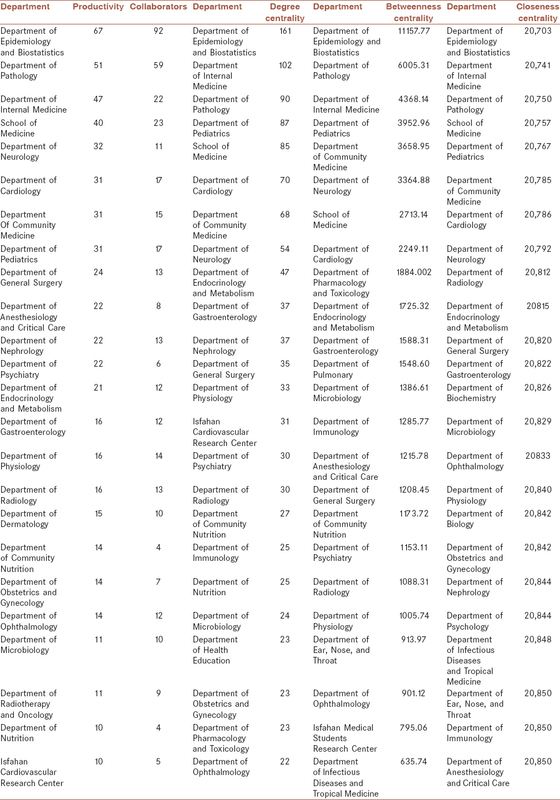 In productivity and triple centrality metrics, Department of Epidemiology and Biostatistics, Department of Pathology, and Department of Internal Medicine had the first three ranks. This means that these three departments are the most productive and collaborative groups present in the network. Researchers in these departments tend more toward collaborative and co-authorship works with researchers from other departments and research centers. Based on triple centrality metrics, it can be said that these departments have suitable locations in the network and are positioned at the shortest distance for scientific collaboration with other departments and research centers. This means that these three departments are highly accessible to other nodes. The high closeness metric of these three departments shows their influence, centrality, and key role in distribution of information between other nodes in the network. A study by Mazaheri et al. also reported similar results. Based on the variety of collaborators, “Department of Epidemiology and Biostatistics,” “Department of Pathology,” and “School of Medicine” had the largest number of collaboration with other departments. This shows the power of these three departments in connecting to other departments and research centers as well as transferring information through the co-authorship network. One of the reasons for the strong presence of “Department of Epidemiology and Biostatistics” in various indicators is due to the definite role of the researchers of this field as the statistical consultants in dissertations or other clinical studies. Furthermore, using multiple affiliations by some researchers has also improved the ranking of some departments and research centers. In analyzing scientific collaboration patterns, it is necessary to consider the relation between the nature of the research and the amount of collaboration. Several studies have proven that experimentalists tend to collaborate more than theoreticians, and theoretical works usually have lower number of collaborations compared to experimental works. Even there are some differences in experimental works. A co-authorship analysis of researchers in the departments of “Biology” and “Chemistry” in York University showed that researchers in the Department of “Biology” had small number of collaborations in comparison with the researchers of the Department of “Chemistry.” Abramo et al. showed that collaboration often happens in medical fields. Studies in medical fields require a large spectrum of specializations which oblige collaboration of different researches with different professions. Studying research projects of the Ministry of University and Research in Italy showed that multidisciplinary projects make up only 11% of all projects. The highest trend for interdisciplinary studies belongs to clinical studies including biology and medicine. In studies analyzing scientific collaboration networks, usually, the performance of subgroups is also evaluated along with the network performance as a whole. Clique analysis is one of the methods for identification and evaluation of cohesive subgroups in social networks. Clique is usually one of the most important indicators of social networks in which members have a large number of interactions and common characteristics, and therefore, the flow of information between them is a lot faster. The results showed that only 30 nodes (8.90 of total nodes) had the presence in minimum cliques size of at least 7 and other nodes were part of cliques with smaller size. On the other hand, in 18 cases, there are no common nodes between cliques, meaning that these cliques had no co-authorship scientific collaborations with each other. Theories in the area of social networks suggest that formation of collaborative connections in social networks depends on common interests between nodes as well as cost and benefit of short- and long-term relations for nodes in the network. Since the presence of two nodes in a clique shows collaborations and common research interests between these two nodes of co-authorship network, researchers and policy-makers can use this information to prioritize scientific collaboration with departments and research centers in the same clique as their own or with departments and research centers closer to them in the co-authorship network. Without doubt, scientific collaboration with departments and research centers with common research interests can improve the quality and quantity of scientific productions. Since social networks always grow through addition of new nodes and connections, it can be also said that departments and research centers with high productivity and centrality metrics play important roles in expansion and completion of co-authorship networks. Therefore, better collaboration between these departments and research centers and also attracting new research centers can help the network's growth and dynamism. Scientific collaboration can have short-term educational results for improving special projects such as group workshops and collaborative readiness audits and long-term modalities such as improved curriculum, experiential learning, and collaboration between graduate students in different fields. The usefulness of this study can be investigated from two perspectives. First, due to the importance of JRMS in Iranian Medical Society, studying its collaboration network between various departments and research centers can play an important role in facilitating interdisciplinary and multidisciplinary studies in medical sciences. Budget cuts in research centers on the one hand and increased cost of medical studies on the other hand highlights the importance of collaboration between departments and had shifted the attention of scientometric researchers from collaboration among researchers to collaboration among departments and research centers. This means that the results of the current study can be the first step in identifying factors facilitating collaboration between departments and research centers at university, national, and international levels. Second, the results of studying possible collaborative relations between departments and research centers using different indicators such as scientific productivity, article impact, journal impact factor, and journal visibility at journal level can be used for improving or modifying the article acceptance process of the journal which can improve the reputation of the journal in scientific community. Lee S, Bozeman B. The impact of research collaboration on scientific productivity. Soc Stud Sci 2005;35:673-702. Katz JS, Martin BR. What is research collaboration? Res Policy 1997;26:1-18. Parreira MR, Machado KB, Logares R, Diniz-Filho JA, Nabout JC. The roles of geographic distance and socioeconomic factors on international collaboration among ecologists. Scientometrics 2017;113:1539-50. Nabout JC, Parreira MR, Teresa FB, Carneiro FM, Cunha HF, Ondei LS, et al. Publish (in a group) or perish (alone): The trend from single- to multi-authorship in biological papers. Scientometrics 2015;102:357-64. Huang DW. Temporal evolution of multi-author papers in basic sciences from 1960 to 2010. Scientometrics 2015;105:2137-47. Leifeld P, Wankmüller S, Berger VT, Ingold K, Steiner C. Collaboration patterns in the German political science co-authorship network. PLoS One 2017;12:e0174671. Tavakolizadeh Ravari M. Ravarmatrix: Concordancing Software 2nd Version. Available from: http://www.mravari.blogfa.com/post - 11.aspx. [Last accessed on 2017 Oct 18]. van Eck NJ, Waltman L. Citation-based clustering of publications using citNetExplorer and VOSviewer. Scientometrics 2017;111:1053-70. 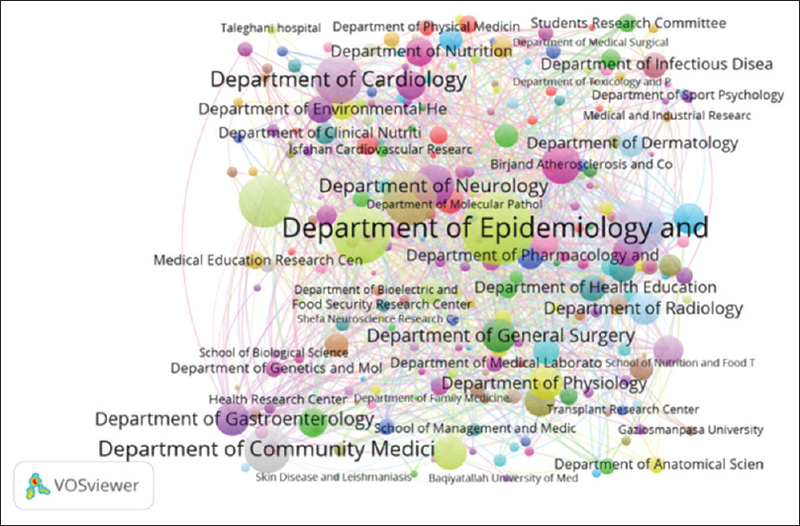 Zare-Farashbandi F, Geraei E, Siamaki S. Study of co-authorship network of papers in the journal of research in medical sciences using social network analysis. J Res Med Sci 2014;19:41-6. Mazaheri E, Geraei E, Zare-Farashbandi F, Papi A. The condition of interdisciplinary communication among various educational and research departments of Isfahan university of medical sciences. J Educ Health Promot 2017;6:46. Gordon MD. A critical reassessment of inferred relations between multiple authorship, scientific collaboration, the production of papers and their acceptance for publication. Scientometrics 1980;2:193-210. Bellanca L. Measuring interdisciplinary research: Analysis of co-authorship for research staff at the University of York. Biosci Horiz 2009;2:99-112. Abramo G, D'Angelo CA, Costa FD. Identifying interdisciplinarity through the disciplinary classification of coauthors of scientific publications. J Assoc Inf Sci Technol 2012;63:2206-22. Fewster-Thuente L, Velsor-Friedrich B. Interdisciplinary collaboration for healthcare professionals. Nurs Adm Q 2008;32:40-8. Bellotti E, Kronegger L, Guadalupi L. The evolution of research collaboration within and across disciplines in Italian academia. Scientometrics 2016;109:783-811. Rouke M, Crowley S, Eigenbrode SD, Wulfhorst JD. Enhancing Communication and Collaboration in Interdisciplinary Research. London: SAGE; 2014.